Shingle Roofing Repair - Castile Roofing: Roofing Done Right! Shingle Roofing is made through different roofing materials; each offer advantages and circumstances. Fiberglass Shingles: A fiberglass asphalt shingle makes use of glass sheet as a base. That base is sealed and coated with asphalt from top to bottom. This creates a waterproof finished shingle. Ceramic granules are also added to the shingle. Organic Asphalt Shingles: Organic shingles are made of waste paper. These shingles are coated with asphalt. Finally, they finish with an adhesive asphalt coating. These types of shingles, like fiberglass shingles, may also have ceramic granules added, are waterproof and very durable. In general both are excellent roofing choices for shingle roofing. Fiberglass shingles are stronger than organic ones but not as durable as their counterpart. They also tend to react poorly to colder climates (not a worry in the Valley of the Sun). By comparison, organic shingles are heavier. They also lack the fire resistance that fiberglass tiles possess due to the materials used in their creation. Why Choose Castile Roofing for Residential Shingle Roofing? 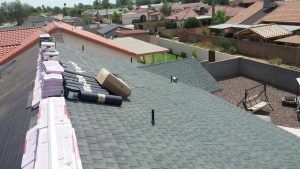 Arizona homeowners who need roof repair or shingle roof construction have no shortage of roofing companies to choose from. Don’t settle for less for your roof! Look for a roofing company that knows the needs of Valley homeowners. Our company is confident and experienced for over a decade; we stand by our work. At Castile Roofing our roofing methods are done to the highest quality with no skipped steps or cutting corners. 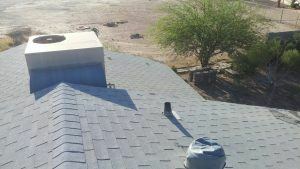 Are you a homeowner in Phoenix, Mesa, Scottsdale, or Tempe who needs service to replace roof shingles? Do you need expert advice and consultation at fixing roofs? Then we encourage you to contact us to resolve your roofing concerns. Our number is (602) 687-7282. Call us today for an estimate and to show you Roofing Done Right!